So Long Suckers is a first time cross-cultural, cross art form collaboration between Yirra Yaakin & Bunuba Cultural Enterprises. Inspired by real-life stories this provocative and powerful new work explores the destructive effects on alcoholism on Indigenous & Non-Indigenous communities. The premiere season was at the Subiaco Arts Centre in Perth from 28th May to 4th June. The reviews are in, and it's a big thumbs up!! 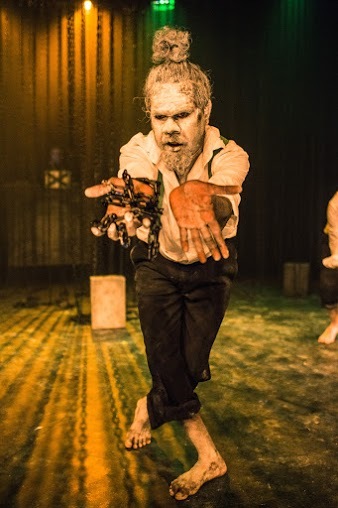 In Bunuba Cultural Enterprises' 2011 production of Jandamarra in the Kimberley, as well as playing the key role of Yilimarra, Emmanuel Brown (EJB) did an inspired cameo as the crippled stockman Jacky that had the audience in stitches every night. We knew we had found a great natural talent. This was one of the sparks for an initiative by BCE to develop new opportunities for performers who had emerged through the Jandamarra project. The seeds of So Long Suckers were sown over a sweaty week that EJB put in with Peter Docker - who also appeared in Jandamarra - in Fitzroy Crossing in January 2013, exploring stories and ideas. Yirra Yaakin came on board later that year, and under the leadership of Artistic Director Kyle Morrison have built a unique production. 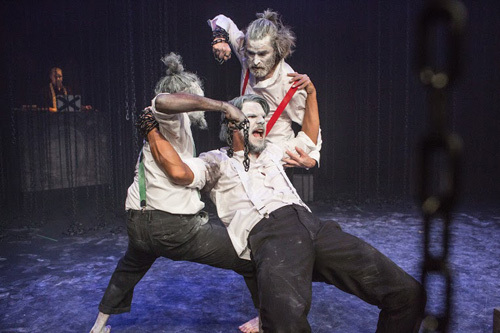 The performers and the stories bring together powerful elements from the worlds of the Bunuba, the Noongar and Irish Australia in a thrilling blend of cultures and theatrical styles. When we meet the Three Wise Men, they are drunk, lost, handcuffed, bewildered and don't even know each other. They fight over grog. They try to remember who they are - but each time they remember it is a grog-police-jail memory. They are prisoners haunted by memories of freedom fighters - Yagan, Ned Kelly & Jandamarra (who all lost their heads and their heads were lost). They each chase down their identities and their purpose, all the while sorting through their memories of oppression and of fighting back. Just when you thought satire was in short supply in new Australian theatre, So Long Suckers restores your faith that someone is looking around, thinking deeply and sharpening the pen. 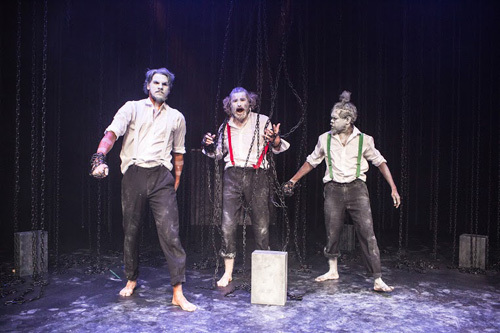 Yirra Yaakin Theatre Company has combined with the Steve Hawke-led Bunuba production company to create a show so original it almost eludes description. 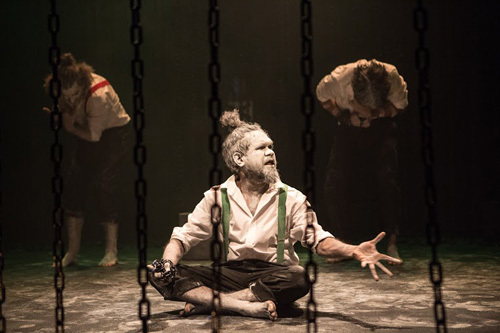 On a small stage bounded on all sides by hanging chains, three men act, sing and dance their way through a 90-minute ode to three historical figures, the Kimberley freedom fighter Jandamarra, the last Nyoongar tribal leader in Perth called Yagan and Ned Kelly. The trio play Three Wise Men who are haunted by memories of these leaders, but who have themselves lost their way. They are drunkard "suckers" handcuffed to each other and attempting - in often comical skits - to remember what landed them in jail. The Jandamarra, Yagan and Kelly stories are characterised as part of the DNA of living Australians, and it comes closest to reality in actors Ian Wilkes and Emmanuel James Brown. Wilkes is a tall Nyoongar actor and beautiful dancer whose stage presence is commanding; his Aboriginal forefathers met and confronted Perth's early colonists. EJ Brown is a Kimberley-born Bunuba actor whose comic timing is immaculate; his initiation as an actor began with the 2011 touring production of Jandamarra, a story about the Bunuba renegade to whom Brown is tribally related. Peter Docker is a versatile actor, novelist and scriptwriter of Irish and English descent who has worked closely with Aboriginal artists, including in the musical version of Jandamarra: Sing for Country, which was performed at the Sydney Opera House. In Suckers, Docker teases out the threads that connect past events to the current cycles of "grog, police, jail" in many towns in Western Australia. 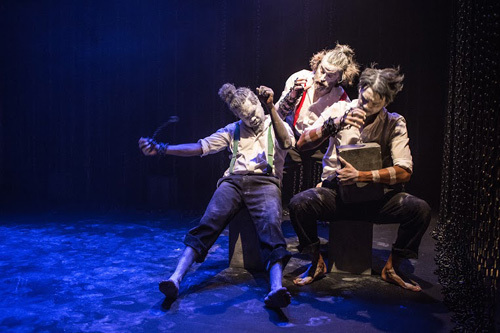 But it never descends into didactic preaching; Yirra Yaakin's director Kyle Morrison deftly turns the white-faced actors into a pratfalling, quasi-tragic trio reminiscent of Beckett or Sartre. Poignant dance sequences, tightly choreographed by Dalis Pigram, contribute as much to the mood as the dialogue. India Mehta's evocative chain curtain design works well, especially in the play's dramatic final moments, and Darren Reutens synchronises a magical soundscape. So Long Suckers is a product of the best mix of talents - a novel idea carefully nurtured since 2013 in remote Kimberley workshops, brought under the theatrical wing of Yirra Yaakin and finessed without loss of its potent authenticity. In an era of disappearing WA theatre companies, there should be more of such collaborations. So Long Suckers is a cry from the heart about the destructive power of grog in Australia. As its writer, Peter Docker, says, "Grog. Police. Jail" has replaced "guns, germs and steel" as a principal agent of the dispossession of the original owners of the country and a wider, similarly disempowered, population. Its performers come from those communities: Emmanuel James Brown is a Bunuba man from Fitzroy Crossing, Ian Wilkes a Noongar man from the Whadjuk (Perth) region, and Docker, a wadjela (white man) whose creative path has led him to embrace indigenous culture, hails from Wiilman country around Narrogin. The director, Kyle Morrison, is also a Noongar man, and choreographer Dalisa Pigram a Yawuru/Bardi woman from Broome. So Long Suckers works around a metaphor with wide and direct historical resonances; that alcohol figuratively "cuts off your head and takes it away" - a fate literally and famously suffered by the characters' outlaw heroes, the Noongar Yagan, the Bunuba Jandamarra and Ned Kelly. "Men without heads", on the booze, in cars, on trains, in parks and on the street, are easy targets for the system of summary arrest and the dreaded bench warrants that endlessly ensnare them. We meet them in a whirlwind of words and movement inside a striking, ominous set (by India Mehta, lit darkly by Chris Donnelly) of chains, bars, blocks and smoke. They are the Nativity story's Three Kings, but staggering and confused, forgetful of what they are seeking. They are also Mr Red, Mr White and Mr Green - wine, whiskey and beer - garrulous, bickering and perilous. These splintered characters argue and cackle, mug and dance (Pigram's compositions are exquisite, and Wilkes, in particular, a compelling figure) to the insistent beats of Darren Reutens, aka Dazastah from Downsyde. When they are drinking in the car, they are circus clowns. When, in better days, they dive for marron up the Canning River or hunting goanna in their holes, they are storytellers, poetical and wise. But when they are beaten senseless by transit guards, bailed up before the magistrates or, like Yagan, made outlaw, ambushed and beheaded, the machine of deprivation and dissolution is exposed. So Long Suckers is not easy theatre, and its density and aggression occasionally reduces its impact. There are some major influences (narrow your eyes sometimes and it's Vladimir and Estragon on stage) that, combined with its breakneck pace of action and textual change, make it a challenge to fully grasp. There's no denying, though, that it is an impressive gathering of artistic talent, indigenous and non-indigenous alike, to expose an evil that afflicts communities, families and individuals across a land we are still learning to share. I enjoyed the privilege of attending a performance of 'So Long Suckers' by the Yirra Yaakin Theatre Company at the Subiaco Arts Centre on the weekend. Here's a little bit about it, and an encouragement to make time to see it this week . So Long Suckers is the result of a long-term collaborative cross-art project between Bunuba Cultural Enterprises and Yirrka Yaakin. Directed by Kyle J Morrison, the play features three stunningly intertwined performances by Emmanuel James Brown, Peter Docker and Ian Wilkes. Highlighting a rich combination of Australian Indigenous and non-Indigenous histories, cultures, aspirations and complexities, in a tight aesthetic frame that somehow manages to embrace the significance of figures such as Jandamarra, Yagan and Ned Kelly (The Three Wise Men . 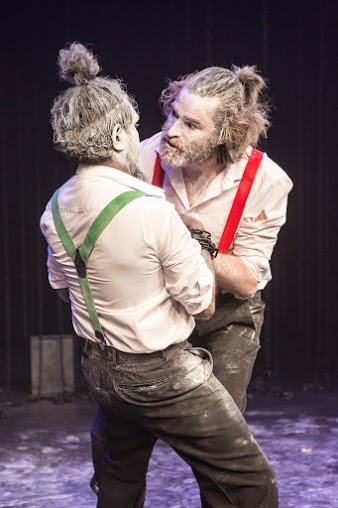 ), this highly distinctive and choreographed play manages to balance depth with humour, and distress with resilience, via an ever-compelling, entertaining and rich dialogue. So Longer Suckers does not shy away from exploration of the tough issues faced by so many Aboriginal women, men and children: It awakens the layered complexities of these while also encompassing the value of inclusive, visually active story-telling accompanied by the careful and occasional use of electronic sound alongside moments of silence. 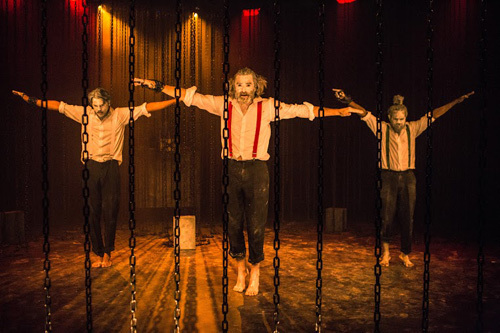 The evocative set-design relies heavily on the symbolism and actuality of chains that both bind and release, and sensitive lighting design distills and illuminates the brilliance of each performer. So Long Suckers is theatre at its avant-garde best. Bravo Yirra Yaakin and Bunuba Cultural Enterprises!